The GPS16X-HVS is a global positioning system (GPS) receiver that provides position, velocity, and timing information. Campbell Scientific configures the GPS16X-HVS and modifies its cable so that the receiver can more easily interface with our data loggers. Connects directly to a CR800, CR850, CR1000, or CR3000 datalogger when PPP time-synchronizing functionality is not used. 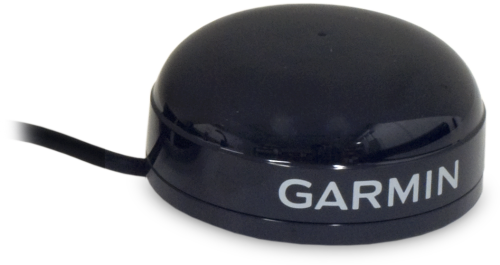 The GPS16X-HVS, manufactured by Garmin International, consists of a receiver and an integrated antenna. It receives signals from orbiting Global Positioning System (GPS) satellites and then uses the signals to calculate position and velocity. The GPS16X-HVS also provides a highly accurate one-pulse-per-second (PPS) output for precise timing measurements. Default settings are typically used. The default settings and options are changed using GPS16 software, which is available, at no charge, from the Garmin website (www.garmin.com). Additional hardware is required to connect the GPS16X-HVS to the computer running the GPS16 software (see Ordering Information for more information). By default, the instruction expects the GPS unit to be set up at 38400 baud, outputting the GPRMC and GPGGA sentences once per second. The data logger expects the start of the second to coincide with the rising edge of the PPS signal. If there is no PPS signal or if the required sentences come out at less than once per second, the data logger will not update its clock. GPS units with lower baud rates can be used with the GPS instruction, but the baud rate has to be set for the relevant Com port it is to be connected to either in the data logger settings or by including a SetStatus command after the BeginProg instruction in the program (for example, SetStatus("BaudrateCOM4",19200)). Baud rates below 2400 bps will not work, as the GPS unit will not be able to transmit the two GPS sentences once per second reliably. Similar problems can be encountered even at higher baud rates if too many optional GPS strings are selected to be output. Receiver WAAS enabled. 12 parallel channel GPS receiver continuously tracks and uses up to 12 satellites (up to 11 with PPS active) to compute and update the position. Baud Rate Factory set to 38400 bps. CR1000 May require an adapter. If PPS input is required, use the A300 level shifter. CR800 May require an adapter. If PPS input is required, use the A300 level shifter. CR850 May require an adapter. If PPS input is required, use the A300 level shifter. CR23X (retired) Contact Campbell Scientific about using the GPS16X-HVS with this data logger. CR3000 May require an adapter. If PPS input is required, use the A300 level shifter. CR5000 (retired) The CR5000 can be connected using an SDM-SIO1A. CR9000 (retired) Contact Campbell Scientific about using the GPS16X-HVS with this data logger. CR9000X Contact Campbell Scientific about using the GPS16X-HVS with this data logger. Our CR6, CR800, CR850, CR1000, and CR3000 dataloggers typically use the CRBasic GPS() instruction to read the GPS16X-HVS. For the GPS() instruction to set the time or use the pulse from the GPS sensor, some data loggers need an updated clock chip. Some data loggers will require an adapter to convert the 3V PPS output of the GPS16X-HVS to a 5 V signal. In August 2014, Garmin changed the GPS16X-HVS PPS output signal from 5 V to 3 V. Units with serial numbers greater than 1A4189318 have a 3 V PPS output signal. When this new design is used with a CR800, CR850, CR1000, or CR3000 datalogger, a 3 V to 5 V voltage shifter is required for use with the PPS signal output. The SW12V or A300 can be used for this purpose. This level shifter is NOT required for the CR6 datalogger. The GPS16X-HVS mounts to a mast or crossarm using the CM235 Magnetic Mounting Stand. Typically, the GPS16X-HVS mounts to the CM235 magnetically with the addition of the 17212 Magnetic Mount. Alternatively, the GPS16X-HVS can be mounted directly to the CM235 using three M4 screws supplied with the 17212 or by the customer. When the GPSReady variable is not 10, does the data logger still synchronize with the PPS signal? No. The system needs to be stable before the information output is used to synchronize the clock. When PPS is not being used, clock operation proceeds as normal, such as when a GPS receiver is not connected. How can four GPS16X-HVS receivers be connected to the COM ports of a datalogger to read all four NMEA strings? This can be done, but only one GPS() instruction can be included in a program because it is not desirable to have multiple inputs competing for clock synchronization. Use the SerialOpen() and SerialInRecord() instructions to pull in the data from the multiple sensors, and use the SplitStr() instruction to parse the data out. If the “gps_ready” output of the GPS() instruction is stuck at or near zero and the data logger clock is not being set, what might be the cause? The GPS receiver is not producing the correct sentences. The GPS receiver is configured with too low of a baud rate. The GPS receiver is producing too many sentences for a given 1 s period. The GPS receiver does not have a PPS (pulse per second) line correctly connected to the data logger. The GPS receiver is a unit with a pulse-per-signal that is not 1 Hz. How can latitude and longitude data from a GPS16X-HVS receiver be recorded on a datalogger and then parsed out? Pull in one or more NMEA sentences from the receiver. Pull out longitude and latitude information from the received data. Store that data in a user-defined data table. The easiest method for receiving and parsing out latitude and longitude information is to use the GPS() instruction. If the “pps” field returned by the GPS() instruction usually displays “990000,” what might be the cause? Refer to the CRBasic Editor Help for the GPS() instruction. The system is working correctly. The datalogger clock has been synchronized and is detecting a PPS line low to high transition within a 10 ms window before the start of the second. Is there a GPS interface that can be used to keep a datalogger synchronized with GPS time? Campbell Scientific offers the GPS16X-HVS for the purpose of synchronizing with GPS time. Other GPS units may be used if they produce GPRMC and GPGGA sentences. Time synchronization accuracy may be improved if the unit has a PPS (pulse per second) output.